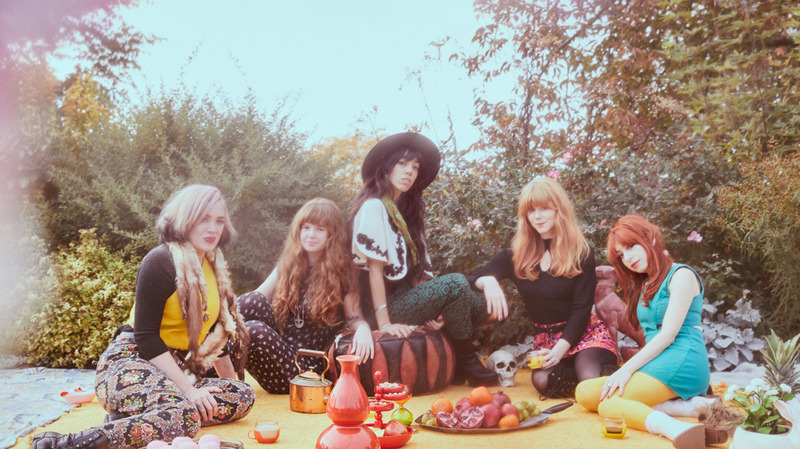 Brooklyn-Based Band Habibi Fuses Farsi Lyrics With Western Riffs The Brooklyn-based band doesn't need to speak English to pack a punch. Frontwoman Rahill Jamalifard talks about songwriting in Farsi and how Middle Eastern rock emboldens her. The Arabic word habibi means "my love," an apt descriptor for Rahill Jamalifard's feelings about her Iranian upbringing and the music she creates. Jamalifard is the frontwoman for Habibi, the Brooklyn-based band that mixes Detroit garage rock with girl group harmonies and surf guitar. The band's newest EP, Cardamom Garden, houses lyrics that move seamlessly between English and Farsi. Cardamom Garden's lead single, "Nedayeh Bahar," translates to "song of spring." It's a subtle nod to the EP's eve-of-spring release. Jamalifard says the spring season is culturally significant for Iran. The vernal equinox marks not only the arrival of spring, but Nowruz, the first day of the new year in the Iranian calendar. Jamalifard was born in Michigan to parents that immigrated from Iran before the Iranian Revolution of the late 1970's. In addition to the traditional Iranian music her parents played for her, Jamalifard also loved to listen to Middle Eastern psychedelic rock from the '70s, created at a time when rock was taking off internationally. She remembers her fascination with the sound that came from Middle Eastern minor scales and Western rock riffs. "It was cool because they were singing my mother's tongue, but in such a hip way," Jamalifard says. Jamalifard practiced Farsi during summers spent visiting family across Iran, an experience that several of her Iranian friends were denied in favor of assimilation. "I come from a place where differences were really celebrated," Jamalifard explains. "A lot of my Iranian friends weren't really allowed to witness their culture. Their parents, out of fear of prejudice and racism, wanted to keep that from them." Today, Jamalifard is thankful that she can consult her parents when she's writing lyrics, laughing that her father has become a dictionary for her. Her bandmates don't speak Farsi, but that doesn't stop them from playing Jamalifard's music passionately. "Even if it's foreign, it can still hit you just as much as a song sung in your native tongue," Jamalifard says. A previous version of this story incorrectly referred to habibi as a Farsi word. The word is in fact Arabic. Jamalifard says it is commonly used in Iran.